Touch and drag your finger anywhere on the screen to aim. Aim at the enemy directly in front of you. Your weapon sights make it easier to target enemies. Tap the sight button to bring up your sights. Slide the zoom button down to get a closer look at your target. When ready, tap the button to shoot the enemy. Support missions are a great way to earn extra bucks. Tap the swap button to swap between your weapons. Tap the arrow buttons to move moving will help you find hidden targets. Moving will help you find hidden targets. Tap the thermal button to see armored spots on the enemies. Thermal can also reveal difficult to find enemies. You must complete all the black ops missions to unlock the next region. These missions require powerful upgrades. Complete primary and support missions to earn rewards to upgrade your weapon. You can get full energy in Kill Shot app at anytime. You can get this cheat by changing your phone's time setting. Close your Kill Shot app by either restarting your phone or by killing it on your task manager. 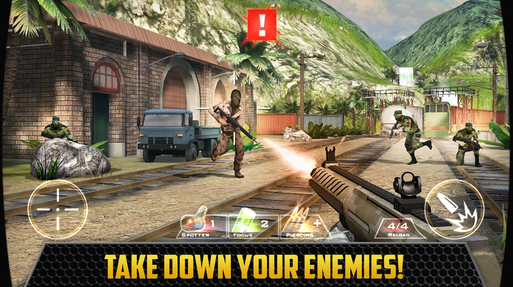 Open Kill Shot app and you will get your full energy. Open Kill Shot app but do not play a single game. Open Kill Shot app just to make sure that there is no problem. Fortunately you can do it manually! To do it manually, just use search function in your hex editor app, enter your current Gold and Money value in Kill Shot and search for it (choose DWORD) . If you see a large list of results, you need to change the value of current Gold and Money value in Kill Shot by either consuming them or adding them. Go back to the list and find your new current Gold and Money value in Kill Shot to the large list and finally you can edit the value.